Redesign and reconstruct three miles of Highway 169 to a new freeway system through Elk River from Hwy 101/Hwy 10 to 197th Ave, Sherburne County. Construction is scheduled to begin in 2023. Sign-up for project email updates. 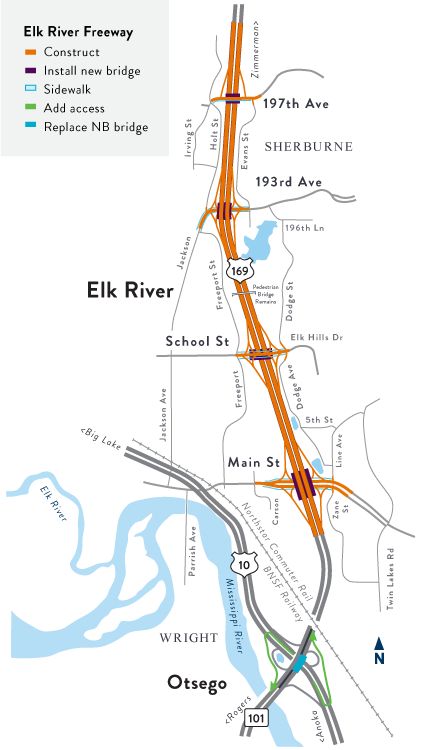 April 2019 - MnDOT is currently considering layout options for this future freeway project In Elk River. A contractor and final design team will be hired to work together to determine the best, cost-effective plans for the construction project. In fall 2019, MnDOT along with Sherburne County and the city of Elk River, will schedule a public informational open house. Stay tuned. More information to come.